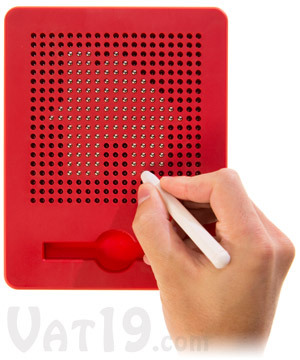 Kids (and fun-loving adults) will love the Magnatab Magnetic Drawing Board and Stylus. Using the magnetic tip of the included stylus, pop individual beads to the surface of the board with a satisfying click. Let your imagination guide you to draw letters, shapes, and patterns on the 19x19 bead board. And if you make a mistake, "erase" a bead by pressing on it with the tip of your finger. 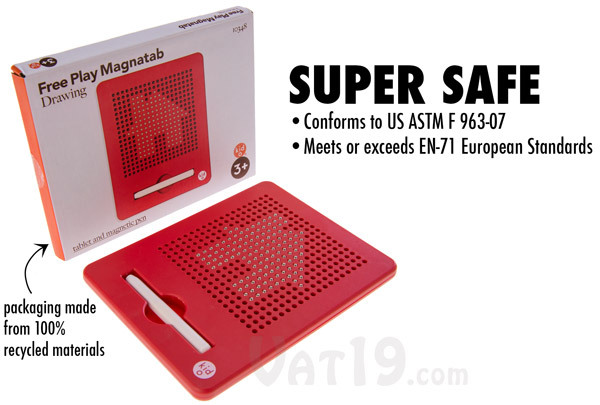 Because all of the 361 magnetic spheres are encased in the board and cannot fall out, the Magnatab is a great on-the-go toy. Meets or exceeds all US and European toy safety standards. Ages 3+. Dimensions (bead board): 7.5" x 6" x 0.5"
We know what you're thinking, "That's a tablet? Where's the screen, camera, and mind-reading port?" Well, the Magnatab is a different kind of tablet. While it may not be able to post pictures of your lunch, it is addictive in its simplicity. Magnatab is a 19x19 bead board grid. Using the magnetic tip of the included stylus, you draw shapes, letters, and pictures by popping the spheres to the surface. The satisfying popping and clicking is nearly impossible to resist. 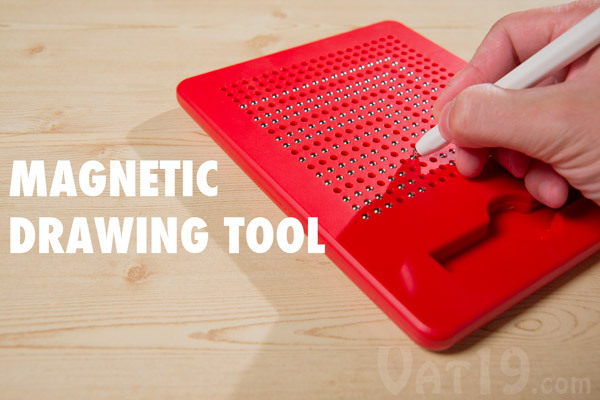 Use your imagination to draw letters, shapes, and patterns using the included magnetic pen. See (and hear!) it in action! Check out the short video below to see and hear the Magnatab in action. Also, I'm sure many of you will recognize the design we drew — assuming you're a child (or fan) of the 80's. It's all in the popping! Simply press the tip of the stylus into one of the board's holes to pop the magnetic sphere to the surface. Feeling and hearing the bead stick to the stylus are what makes creating shapes, designs, patterns, and letters so addictive on the Magnatab. 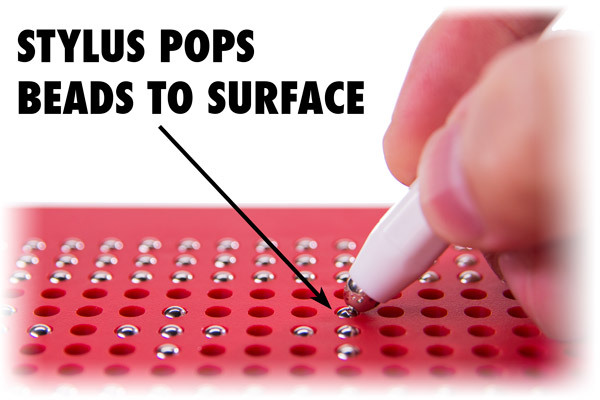 Use the stylus to pop beads to the surface of the 19x19 grid. 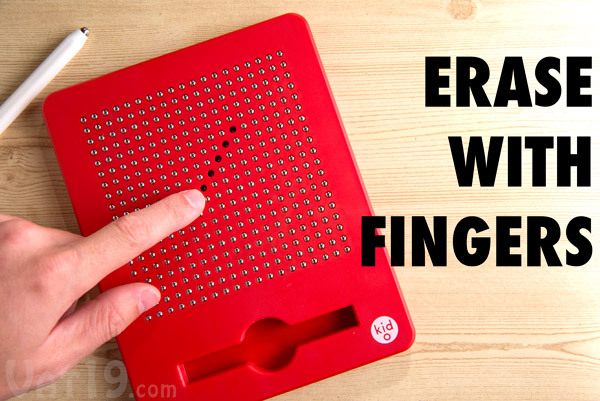 Using your fingertip, simply push a sphere back into the board to "erase" portions of your design. To erase on the Magnatab, just use your fingertip! 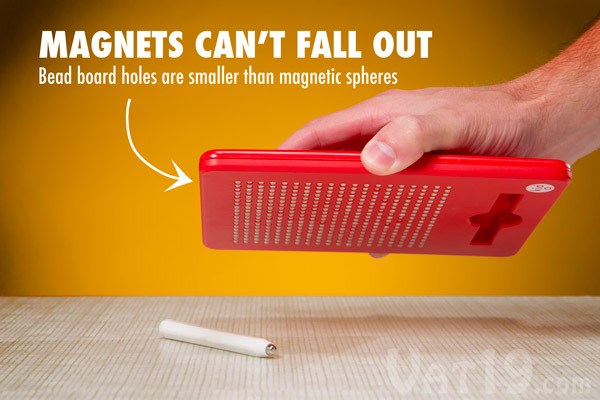 You'll never lose a single magnet! Toys with small parts (especially magnets) can be dangerous for young ones. Fear not with the Magnatab! The board is designed so that none of the magnets can ever escape. All 361 magnets are safely contained within the Magnatab. Because all of the magnets are safely contained within the board, you'll never need to worry about losing any! To take your Magnatab on the go, follow these steps. Step 1: Snap the stylus into its storage slot in the Magnatab. Step 2: See Step #1. The Magnatab is the perfect on-the-go toy. 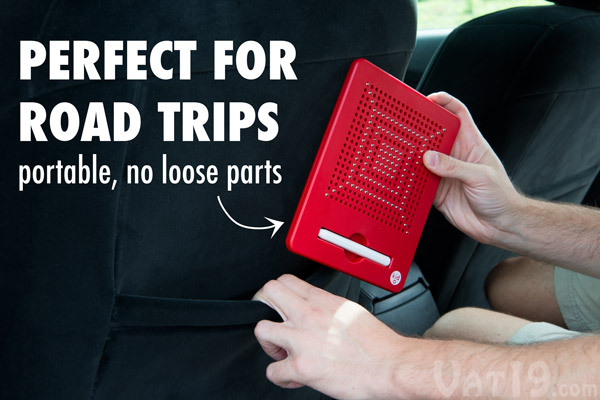 The company behind the Magnatab is determined to ensure their products are both fun and safe. The Magnatab has been tested by a third-party, independent laboratory in order to confirm that it meets or exceeds all applicable US and European safety standards. Also, the Magnatab's packaging is made from 100% recycled materials. The Magnatab meets or exceeds US and European safety standards. A flexible magnetic construction set.